A former chief rabbi says Jeremy Corbyn's comments about British Zionists are the "most offensive statement" by a politician since Enoch Powell's "Rivers of Blood" speech. In an interview with the New Statesman, Lord Sacks accused the Labour leader of being an "anti-Semite". A 2013 video of Mr Corbyn accusing some British Zionists of having "no sense of English irony" emerged last week. A Labour Party spokesman called Lord Sacks's comment "absurd and offensive". Zionism refers to the movement to create a Jewish state in the Middle East, roughly corresponding to the historical land of Israel, and thus support for the modern state of Israel. 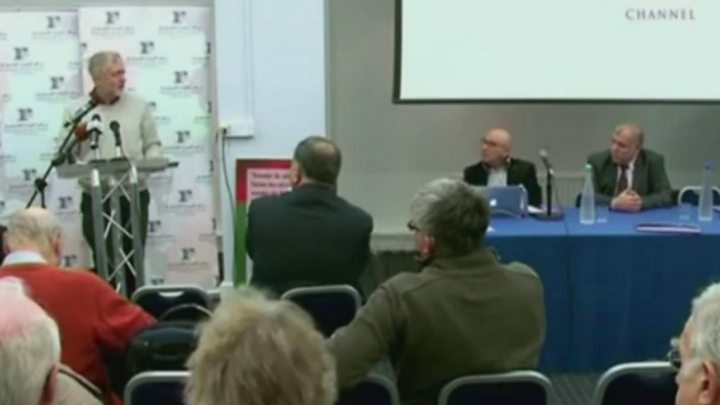 The clip - published by the Daily Mail - showed Mr Corbyn speaking at the Palestinian Return Centre and recalling a disagreement between some Zionists and the Palestinian representative to the UK, Manuel Hassassian, following a speech Mr Hassassian had made in Parliament. He said: "This [Hassassian's speech] was dutifully recorded by the thankfully silent Zionists who were in the audience on that occasion, and then came up and berated him afterwards for what he'd said." Mr Corbyn, who was a backbench MP at the time, went on to claim that the people concerned "clearly have two problems". "One is they don't want to study history, and secondly, having lived in this country for a very long time, probably all their lives, they don't understand English irony either." 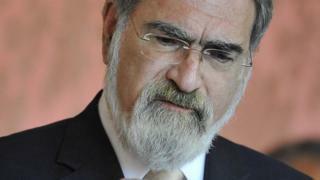 Speaking for the first time on the anti-Semitism row within the Labour Party, Lord Sacks - who held the post of chief rabbi between 1991 and 2013 - told the magazine: "The recently disclosed remarks by Jeremy Corbyn are the most offensive statement made by a senior British politician since Enoch Powell's 1968 'Rivers of Blood' speech. "It was divisive, hateful and like Powell's speech it undermines the existence of an entire group of British citizens by depicting them as essentially alien." Crossbench peer Lord Sacks said Mr Corbyn could only be judged by his "words and actions", before adding that he had given support to "racists, terrorists and dealers of hate who want to kill Jews and remove Israel from the map". Lord Sacks said: "When he implies that, however long they have lived here, Jews are not fully British, he is using the language of classic pre-War European anti-Semitism. "When challenged with such facts, the evidence for which is before our eyes, first he denies, then he equivocates, then he obfuscates. "This is low, dishonest and dangerous. He has legitimised the public expression of hate, and where he leads, others will follow." What is the significance of the 'Rivers of Blood' speech? Conservative MP Enoch Powell delivered a speech in 1968 to a local Tory party meeting in Birmingham. It came days before the second reading of the 1968 Race Relations Bill, which led to the Race Relations Act - making it illegal to refuse housing, employment or public services to people because of their ethnic background. The speech was anti-immigration and saw Mr Powell reference observations made by his Wolverhampton constituents during the speech, including: "In 15 or 20 years' time, the black man will have the whip hand over the white man." He ended with a quote from Virgil's Aeneid, when civil war in Italy is predicted with "the River Tiber foaming with much blood". The speech became one of the most controversial in British political history and ended Mr Powel's career in Edward Heath's shadow cabinet. Lord Sacks said the leader of the Labour Party was "an anti-Semite", at a time where Jews were still being murdered in Europe "for being Jews", and "within living memory of the Holocaust". He said: "For more than three and a half centuries, the Jews of Britain have contributed to every aspect of national life. "We know our history better than Mr Corbyn and we have learned that the hate that begins with Jews never ends with Jews. "Mr Corbyn's embrace of hate defiles our politics and demeans the country we love." On Friday, Mr Corbyn said the comments had been made to "defend the Palestinian ambassador in the face of what I thought were deliberate misrepresentations" from people "for whom English was a first language, when it isn't for the ambassador". He said: "I described those pro-Israel activists as Zionists, in the accurate political sense and not as a euphemism for Jewish people - and that is made clear in the rest of my speech that day. "I am now more careful with how I might use the term 'Zionist' because a once self-identifying political term has been increasingly hijacked by anti-Semites as code for Jews." Allies of Mr Corbyn said the speech had been "taken out of context", with shadow chancellor John McDonnell saying the focus should not be on what Mr Corbyn said five years ago but on tackling anti-Semitism in British society, including within Labour. But the leader was criticised by other members of his own party, with Jewish Labour MP Luciana Berger describing the comments as "inexcusable" and making her "feel unwelcome" in the party. In response to Lord Sacks's comments, a Labour spokesman said: "This comparison with the race-baiting Enoch Powell is absurd and offensive. "Jeremy Corbyn is determined to tackle anti-Semitism both within the Labour Party and in wider society. And the Labour Party is committed to rebuilding trust with the Jewish community."